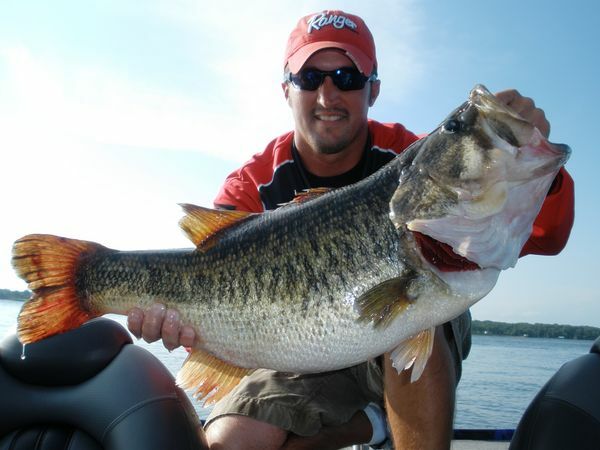 If you like fishing for some big fish, then you need to cast your lure in one of the best Texas lakes that offer you an opportunity to land a big trophy fish. The 6 lakes listed on this page have have produced some record fish. So grab your gear, some beer, and your dreams and head to one of these lakes to catch a potential record breaking trophy fish. To find the best bass fishing lakes in Texas near you plus fishing guides, fishing cabins, boat rentals, lake reviews and more check Texas Outside's Lake Map. A 20,000 acre lake stocked with more than two million fingerling Florida-strain largemouth bass. Launch your boat and fish at the north end of the lake to avoid all the pleasure boat traffic. You'll be most successful with a variety of shad imitation lures or soft plastic baits. Hybrid stripped bass are growing in popularity and can be caught most any time of year. Here's a link to Texas Outside's review of Lake Conroe to find some fishing guides, ramps, restaurants, and more information on fishing on Lake Conroe. Located along the US-Mexico border, this huge impoundment on the Rio Grande is excellent for trophy fish chasers as well as anglers wanting to catch 4 to 6 pounders.. In 2012, Falcon International Reservoir was ranked first for trophy bass in the United States, but by 2014 the Reservoir's rank had dropped to number fourteen. Trees, underwater grasses, and deep creek beds create hiding and feeding places for some big bass. Strict catch and release rules plus a multi-million dollar breeding program make Lake Fork one of the best bass fishing lakes in the country! 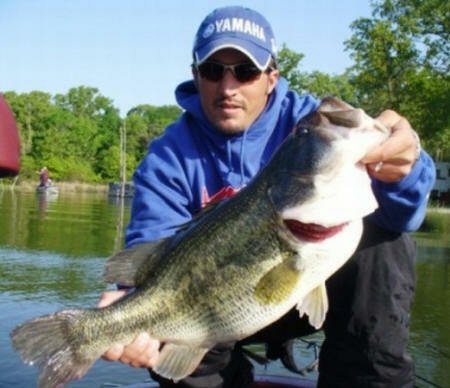 Seven of the ten largest bass ever caught came from Lake Fork - the biggest was 18.18 pounds. 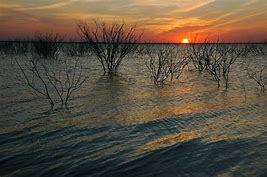 Texas Outside's Review of Lake Fork will tell you more about the lake, fishing guides, fishing cabins, and more. Marine Creek Lake is small at 250 acres, but it's producing some big fish - a 14.57 pounder in early 2019! You'll find the big fish lurking around the vegetative shorelines and Texas Parks & Wildlife has installed some man-made fish attractors - use your GPS or fish finder to locate the fish attractors. Named the Top Bass Lake in America in 2018 by Bassmaster Magazine because of it's hot streak of producing double digit bass. Sam Rayburn is second only to Lake Fork in the number of record trophy catches. Timber, brush, laydowns, and creek channels provide upper-lake game fish habitat. Check out Texas Outside's Review of Sam Rayburn Reservoir to learn more about fishing and boating on Sam Rayburn Reservoir. .
Lake Travis is noted for producing good numbers of largemouth bass, but they tend to be small. Lake Travis is better known for its party coves, restaurants on the water, and lots of pleasure boaters, Lake Travis was the recent host for the Bassmaster Elite Texas Fest. Read Texas Outside's review of Lake Travis to learn more about the lake and all it has to offer.